I have been puttering around doing some much needed clean up around here...in 100+ temps...not very bright, I know. Even our last puppy, (whom Sugar Plum Fairy and I are pushing to keep) is hot and pooped. The ivy had gotten out of control and looks much better now. I want to plant some moss of some sort in here as well...it is shaded by a great Raywood Ash tree except in the late afternoon. Ginny and Orchid are always curious and love when I treat them to the ivy clippings. I always hear my Mom singing "Mares eat oats and does eat oats and little lambs eat ivy. A kid'll eat ivy, too...wouldn't you?" Not sure why that song pops into my head every time. The wistria is fading but still has a few blossoms that attract bees like nobody's business. The garden is finally producing and looking decent. We are having hot temps now, but they were sure slow in coming (not that I a complaining) and the tomatos would not turn red...they are now. The black cherry tomatos are wonderful and we have gobs. The beans are doing well and I have one eggplant...think it will be consumed this week...I do love eggplant's blossoms...such a pretty color. We even have a strawberry plant that is trying its hardest to continue producing in the heat...it's a battle as to whether we get the fruit first or the chickens at this point. Sugar Plum Fairy always plants one flowering plant in the garden and this was her choice this year...pentas. The hydrangeas ALWAYS remind me of the Azores. The islands have enormous bushes lining their streets like hedges and since this is the time of year I have been, they are always in glorious bloom. The pool water is gorgeous and sure feels good, but the dust sure makes vacuuming a must...this morning. I do enjoy floating in the pool with the view through the orchard. So peaceful...until a 7 year old cannonball arrives on the scene. My father in law's rose...mkes me smile every time I see it. Many times, this is the olnly flower in bloom in the yard. Shasta Daisies ALWAYS make me sentimental...just the name Shasta takes me back to my childhood. After 40+ years away, is still feels like home. 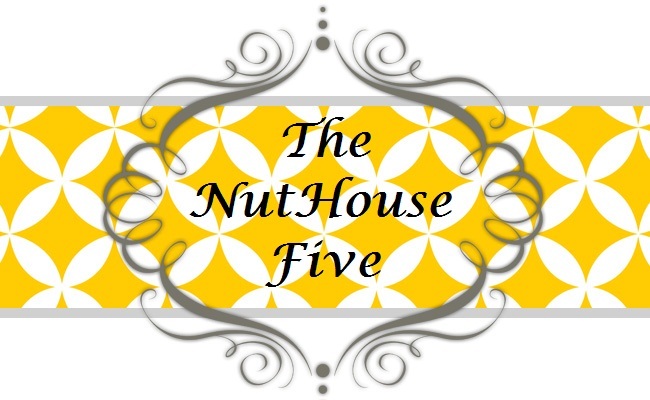 I am linking up with three parties today...check them out it you have a moment and thanks ever so much for stopping by the NutHouse! Neat yard tour! We are ready for rain and a cool down also. awwwwwwwwwwwwwwwwwwwwwwwwwwwwwwwwwwwwwwwwwwwwwwww - love the puppy!!! I've had two shepherds and I adore them! Love your signs as well. Looks like the crops are coming along well for you, my poor garden is quite a mess from all the rain we've had here. No sunflowers at all this year and my rudbeckia (a garden staple for me!) is non-existant. Oh well, better luck next year! Thanks for visiting me! I enjoyed your post so much. You have a lovely flowers even with the high temps. Enjoyed seeing your animals, too! Have a great weekend. Love the horse pics! Daisies are my favorite flower. So simple but such beauty. Your pool does look very inviting. Been hot on the Atlantic coast, too. My tomatoes are just beginning to ripen and I have to stay ahead of the birds. I have never had much luck with strawberries. So I finally gave up and began picking my own at a local farm not far from here. I love that song! So few people recognize it whenever I find myself humming it. Really *pretty* post! Oh, I remember that song...thanks for bringing back the memory! Love those little goat faces...they're on my wish list!